This week on the podcast the guy’s are fresh off the road from the 1% workshop in Dallas. A workshop designed to help individuals live a life of abundance versus a life of lack. During the workshop Karl had his shining moment on stage and received a standing ovation for his presentation. This moment led to a conversation on how and when does someone make a turning point in their life. Many of you listen to this podcast weekly but you still haven’t made the turning point that will change your life. Grab your pen and pad and take notes so you can start taking the steps needed today. You aren’t growing because you’re worried about what the wrong people think. The beautiful thing about discipline is that you choose what to sacrifice. Don’t allow people to give you second-hand fear. This week the guys are recording the podcast live from Jamaica from the Phenomenal Life event and are in company with financial expert Rob Wilson. How many of you have money problems? Lack of income, savings, or just not knowing what to do with the money you have. Rob Wilson breaks down why money is in fact VERY important in your life and how to use it to your advantage. Be prepared to walk away from today’s podcast with a plan for your wealth and the rest of your life. Money is the second most important thing in your life. If people realize who they were and that you don’t have to make money but you are money. Most people when left to your own devices will not make good choices for themselves. Everywhere has problems but everywhere doesn’t have the same opportunities. Keeping up with the joneses. A term we’ve all heard before and the topic of the podcast today. Have you ever wanted something because someone else has it? Or have you ever thought that because you were making a certain amount of money you were obligated to go and buy the latest designers? The guys dive deep into what the real motivating factor is behind making certain purchases or wanting certain things. Be prepared to assess your own intentions behind all the things you want to obtain. Money is not wealth, you’re short sided if you think it is. Wealth means you’re balling in every category. You’re broke because you’re trying to do something someone else does the exact way they do it. At one point do you keep trying something and give up on it? That’s the question that ET poses on today’s podcast. We all have areas in our life where we want to give up on something, or we have already given up. Relationships, business ventures, maybe even certain career choices. The guys carefully dissect how you should assess whether or not you should give up on anything that you’re seeking out. While listening to today’s podcast be sure to keep your current situation in perspective before you make a final decision to give up or keep going. [30:00] - When do you stop trying? Don’t switch up what works. Pay attention to your indicators to decide whether or not you should move forward. The process is what’s deep not the goal. We look back at things with reverence but we look to the future with fear. This week the guys are back from their holiday vacation and are pumped up for 2019. The topic for today is what does it take to go from good to great? What are the systems and routines that take a person to the next level? ET goes over the importance of studying oneself and how that is the best tool to help you get to the next level. Don’t change your prices in 2019 if you’re not increasing your value. If your routine is off your results are off. Sometimes you’re scared to lose something when on the other side there is something greater. The success is in your daily routine and the 5 people closest to you routine. Momentum can swing either way, towards the negative or the positive. Today’s episode of The Secret to Success highlights some of the most value added moments of the year. Moments that made listeners self assess and make the proper adjustments in their business and personal life. If I were you I would grab a pen and paper as you listen some of 2018’s most value added moments. Join Breathe University this holiday season as we offer our low rate of $20/month. Get 3 courses taught by ET himself as well as access to a community of over 2,000 like minded individuals. Visit www.breatheuniversity.com and join TODAY ! Success is not keeping up with the jones it’s living your life on your own terms. When you’re in the natural you’re the best person you can be. What you need to get to the next level is just a belief in yourself. Perfection is not going to happen overnight. If you’ve been listening to this podcast for a while then you’ve heard the guys talk about the inability to self-assess. A concept that they’ve taught and drilled into the heads of listeners and fans over the years. CJ realized that while they’ve been teaching others how to self-assess, they haven’t quite taught people how to fix things once they’ve done the self-assessment. The guys, along with Josh Hatch, give some very transparent personal examples on how they executed after self-assessing. [52:00] - Who Are You ? Take responsibility for your healing. In order to change something internal you have to have a greater external force. You break the cycle by doing something different. If your a sports fan you know that recently the Boston Red Sox won the world series again. There’s an interesting fact that there is only one player on the team who was a part of the team the last time it won the World Series in 2013. What does that mean ? It means that being a part of a winning culture can be a game changer in your life. A winning culture can and will help you perform at your highest level if you welcome the challenge. Assess your culture of friends, mentors, and colleagues. Is it a culture that promotes greatness or a culture that helps you make excuses for being average ? Your reality is shaped by the things that you learn and see. You have to get in a division of winners. Get with the experts and confirm what you know. We’re operating out of our conditioning instead of our capacity. Pride and ego. Two characteristics that can hurt us and help us if used in the correct manner. On today’s podcast CJ brings an interesting experience with someone who asked for his opinion. The end resulted in the individual getting upset and letting their ego get in the way of not getting the coaching they needed. Has your ego ever prevented you from getting the information that you needed ? ET breaks down the difference between having pride and ego as well as how to, and who to, get input from. People’s ego get so inflated that they can’t HEAR anything. There’s no way to grow if you’re not doing anything different. You should have a board of advisors to support you before you need their support. Don’t look for constructive criticism from people who haven’t constructed anything. This week on the podcast ET takes over with what he thinks is wrong with people who want to blow up but haven’t yet. Most people won’t make as much money as they want because they aren’t able to solve problems. ET gives listeners 5 things to consider when it comes to problem solving and how you can use these things to be successful. Grab your pens and paper you will definitely need to take notes while listening to this episode. This week on the podcast the guys dive deep into the legacy of Chris Daniel. Chris Daniel introduced the Animal Assessment AKA The DISC Assessment to the ETA and Breathe University family. This assessment has changed the way that each of the guys communicates, do business, and build their relationships. They talk extensively about why you need to figure out your animal, study your animal, and then embrace it. If you haven’t already taken the assessment do so today by clicking here. This week on the podcast the guys dive deep into the importance of investing in yourself. Have you found that you prefer things for “FREE” ? Are you the type of person who tries to figure out how to get something for “FREE” instead of paying ? ET calls it the shortcut mentality and he explains why this mentality does not work when you’re trying to be successful. This week on the podcast the guys discuss momentum. ET talks about how he got momentum in his current season. The importance of being intentional and deliberate plays a huge role in keeping your momentum once it’s started. Being intentional and deliberate helps you “create the rain”. If you aren’t picking up the steam you want in your life or business it’s time to create the momentum. [05:16] - Congrats Tobe ! Don’t wait for the momentum to go to the next level, take it to the next level. If you want to see momentum in your life you have to be intentional and deliberate. The dangerous thing about losing momentum is that it kills your confidence. Sometimes you have to use old momentum to kickstart the new momentum. This week on the podcast ET talks about an experience he had over the weekend while traveling and speaking. The experience gave The Hip-Hop Preacher somewhat of a push and made me realize that no matter what you still have work to do. There is never a time where you don’t have to prove yourself and after you master one level there’s still another level to conquer. Listen as the guys talk about how these experiences keep him humble and how you should continue to improve your craft no matter what. Don’t talk championship talk without reinforcing everything in your environment to make sure it’s on a championship level. If you don’t learn how master you, you will have someone else mastering over you. On today’s podcast the guys take a deep dive into ET’s success. How he got where he is ? How he managed to keep a high level of character on his run ? How he has managed to stay consistent and productive ? E talks about what he does on the days he may not be feeling it. Listen to today’s episode with a pen, paper, and an open mind as you learn a few more of ET’s Secrets To Success. Is the goal to win or to look like you’re winning ? On today’s podcast the guys talk about the effects of people displaying their “highlight reel” without putting in any real work behind it. We all know that social media plays a huge role in business and building a brand. The guys discuss the side effects of portraying like you’re doing something when you’re really not doing anything. Do yourself a favor and self assess what you’re posting and why you’re posting on social media. Are you posting it because it's really happening ? Or are you posting it to act like it's happening ? This week on the podcast the guys talk about the struggle of the triple double life. At the end of the day there are only so many hours in the day and sometimes you have to sacrifice something. How do you decide what to sacrifice ? How do you perform at a high level consistently ? ET argues that it’s easier to live the triple double life when you’re performing at a high level and that it’s hard when you’re average. Grab a pen and paper as you listen to today’s podcast and learn how to conquer the triple double life. ET and the guys often talk about the importance of your environment. The importance of being around like minded individuals and making sure you have the right people in your circle. This week on the podcast they tackle the notion that says changing your circle makes you disloyal. What’s the balance ? Do you stay with your friends and not go to the next level ? Do you go to the next level and lose your friends ? ET stresses that you have to understand you have to give up something. You have to decide whether it will be certain relationships or the opportunity to become the greatest version of yourself. Which one will you choose ? This week on the podcast the guys recap the Boston Take Control event. In the words of CJ, he could tell that someone’s head was about to get ripped off. ET talks about how he prepares for the Take Control workshops and what Taking Control actually means. It’s not just about creating a business, a brand, and becoming successful as an entrepreneur. Listen as ET and CJ talks intensively about the process of Taking Control and what it means to get your freedom. [10:11] - Am I Tripping Or ? On this week’s podcast the 3 Amigo’s are back together again and they’re talking about giving. Is it hard for you to give ? Do you believe that if you give it will be given back to you ? CJ poses the question to ET in regards to how it’s so easy for him to give without thinking twice about it. The answer to his question isn’t based on the amount of money in your bank account it’s a mindset and the guys are going to teach you how to get a giver’s mindset. This week’s podcast was live from the Phenomenal Life Cruise. ET kicks off the conversation by asking a question about balance. How do you find the balance between family responsibilities and going after a dream ? The guys talk extensively about why balance is so important while chasing a dream and having a family and how they deal with it. Well into the podcast the conversation transitions the difference between being a giver and a taker. The guys distinguish the difference between being a giver and a taker as well as the science behind being a TRUE giver. [16:12] - What is the balance ? How many of you have ideas that are literally stuck in your head ? You have a gift or a talent but you never take the time to really focus on operating in that gift. Instead you continue to do work you hate every single day because it’s the safe thing to do. The guys this week discuss this complex and what really happens when people fail to make the decision to start. Why are people afraid to start ? Why are they afraid to fail ? The guys, along with Josh, discuss what’s real and what’s fake when it comes to taking the leap of faith and going after your dreams. [26:12] - When Is It Time To Start ? [37:17] - Why Think Negative ? [1:07:10] - Hey Josh ! This week on the podcast participants of the ETA Game Changers Speakers Program got a chance to be the live audience for the guys. The format was a bit different this week as CJ asked two Game Changers members to speak about their truth followed by a great Q & A session with the audience. Although different from the normal episodes this episode is still packed with value. The guys answer questions about what success means to them, when CJ told ET he had to become a household name, and what the true mission is for The School Days Foundation. RXBar is a whole food protein without fillers, additives, or sugars. Visit www.rxbar.com/success for 25% off your order. Just use the code SUCCESS at checkout. Have you ever found yourself scrolling on IG or facebook and wishing you had something someone else had ? Wishing you had the car, the house, or the relationship that someone else has. This week the guy’s talk about the dangers of comparing your life to someone else’s highlight reel. They explain that the dangers of doing this creates a false sense of happiness. Some people think that having a lot of money or success in their career will make them happy the guy’s explain why money and success doesn’t solve problems that you still will face. [08:40] - Am I Tripping Or ? Often times in business you’ll run into individuals who want to do business or may even be doing business, yet they don’t understand business. ET expresses his frustration with these individuals because what they don’t understand is the sacrifices that come with doing business. The guy’s pack this week’s podcast with plenty of insight on what it takes to truly to make a business successful. 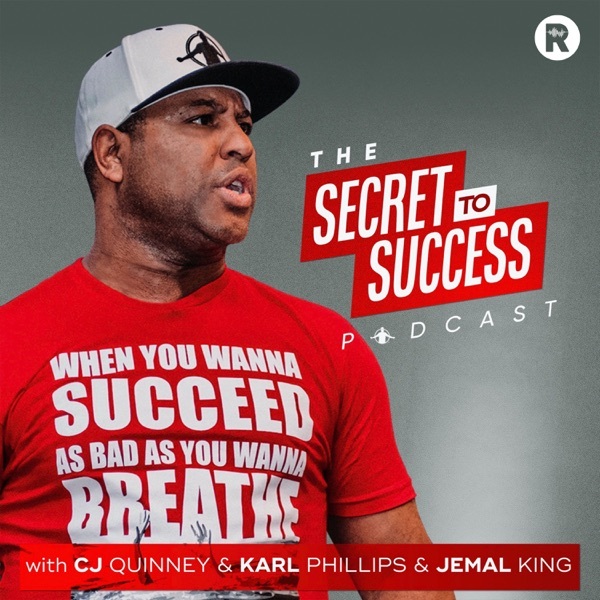 Karl talks about how there is never a perfect time to do anything, CJ chimes in on you should never put money ahead of the brand, and ET explains how your ignorance doesn’t allow you to see what it takes to truly be successful. Grab a pen and paper for this one, you’re going to need it. On this week’s podcast the 4th Amigo Josh Hatch joins the guys again and it doesn’t take long for the guy’s to go deep. We all know the Patriots are returning to the Super Bowl but what is it about this organization that makes them so special. How do they take players that nobody wants and turn them into champions ? Josh calls it the underdog culture. The culture and attitude of believing that no matter what you always have something to prove. The second half of the show ET talks about encountering what he calls a pack of gazelle’s. Listen closely to the lessons that ET gives based off of his experience with two people who were not ready for an opportunity of a lifetime. [02:00] - Am I Tripping Or ? It’s a brand new year and everyone is pumped up with their new year’s resolutions and goals. Unfortunately most people will quit before february gets here. In today’s episode CJ ask ET how he sticks with his routine and how he keeps it going. ET reminds us that the most important thing we can do to hit our goals is to begin doing something that we can sustain. Doing something that you can sustain creates consistency and will get you to your goals and you’ll see results. Be sure to listen to the entire episode as the guys gives you a sneak peek of their Breathe University Mastermind Sunday Call that featured podcast guest Jamal King. For more information on joining Breathe University visit the website. Casper is the best bed for better sleep. Award-winning mattresses and sleep products for your best rest. Use our code STS to get $50 off select mattresses. This week on the podcast things are a little different. CJ sits down and interviews ET one on one in the legendary Patchwerk Studios. CJ wanted to sit down with E and ask him the questions that people don’t ask him. ET shares some incredible moments that helped him solidify his calling as a speaker. For the first time he also opens up about his faith and how his relationship with God has gotten him to where he is today. Prepare to take notes as ET talks about things that he’s never spoke about before. At some point in life we all face an adversity. Whether it’s at home, school, or work you’ve ran into an adverse situation. Now think about that moment and how you reacted to it. Were you calm or were you angry ? Have you ever noticed yourself going off in situations where it wasn’t necessary ? In today’s podcast the guys discuss the difference between people who handle adverse situations differently. The people who go off in situations instead of people who stay calm. ET talks about how he discovered his triggers when he does go off. He gives tips on how to find your own triggers. One of the most important tips ET gives is asking yourself “What’s the goal”. As you run into adverse situations today, tomorrow, and for the rest of your life, stop and ask yourself “What is the goal”. If you’ve been following ET for a while you know what he preaches. Go beast mode, never give less than 120%, and outwork the competition. But what happens when you apply those principles to work and not to your family. Have you found yourself going 120 at work and going on cruise control at home ? This week’s podcast the guys talk about how to balance it all. The truth is there will ALWAYS be something going on. Especially when you’re chasing a dream and building a business. The key is to prioritize things to make sure you never leave your family out of the equation. Story Worth helps you tell memorable stories to family members by binding them together in a beautiful keepsake book. With Story Worth your family members will never feel left out of important memories. Visit www.storyworth.com/success to receive $20 off your first book. Whenever you set goals and dreams you realize there are certain things you have to do and have to reach them. You have to be disciplined, consistent, and most importantly you need accountability. On today’s episode the guys talk intensively about the importance of accountability. Why you need accountability ? How to find the right accountability partners ? What does it mean when you reject accountability ? All of the answers to these questions and more on today’s episode. This week’s podcast the guys welcome two special guests. Cj’s wife Candis and ET’s wife Dede joined the podcast to bring a new take on things. Dede starts it off by letting the guys know what she’s NOT thankful for when it comes to the guys and their relationships with each other. The show then transitions into a more serious note as CJ asks Dede about the impact of ET’s celebrity and why she even chose ET while he was homeless. The ladies bring an interesting perspective to the podcast that all listeners will appreciate. [32:40] - Why Dede chose ET ? [55:00] - When do you quit ? Everyone wants to win the game winner, hit the home run, or make a BIG impact in some way. All of those things are great but we forget about the small consistent things that it takes to make these things happen. On this week’s podcast the guys dive deep into the importance of consistency and how it will change your life. By the end of this episode you will understand that the real hack to becoming successful in life is to be consistent. Sometimes in life you get treated unfairly and people will spit venom on your name. The natural reaction would be to retaliate. In today’s episode you will learn why retaliation is in fact not the best option. Last week ET returned back to his alma mater Oakwood University to speak. ET has written and spoken about Oakwood in many books and speeches but he’s never mentioned that he was banned from speaking on campus. That is until last week when he returned. In this episode you will learn why handling things with dignity is the absolute best thing to do no matter how bad a situation is. [10:06] - What Would You Do ? [18:20] - Fair or Foul ? "Nothing is permanent but change." This week on the podcast the guys have a brand new special guest. Dr. Adam Downs who is a specialist and thought leader on the subject of addiction and recovery. Dr. Downs took his first drink at the age of 10 and began smoking at 14. He talks about abusing prescription drugs as well as having a habit of drinking and smoking before and after school as a teen. As an adult he had a few stints with the law and even became clean for two years. Unfortunately he lost his grandfather his mom got sick and he relapsed. During this relapse Dr. Downs was sentenced to 10 years in prison and it changed his life. Dr. Downs is passionate about the subject of addiction and recovery and has dedicated his life to helping young adults overcome the issue. If you are or someone in your life is struggling with addiction reach out to Adam at adamd@bradfordhealth.net and visit www.bradfordhealth.net. [50:00] - How did this happen ? We’re 13 days into the 100 Day Challenge and the guys are talking about how the challenge is going. While the challenge has been very impactful in all areas the guys specifically talk about how they’re being impacted in the family category. They also talk about the importance of building new habits and how doing things that are of high value will help you create the proper habits. Creating the right habits that will help you create a quality life and that is part of what the 100 Day Challenge is about. It’s not too late to join us just visit 100 Day Challenge With ET. [02:28] - Am I Tripping Or ? [55:35] - What did ET do ? In life everyone will go through a time where you will experience an extreme amount of negativity and even hate. It can be in your family, at your job, or even with some of your closest friends. These type of events often knock us off of our square and instead of focusing on our goals we focus on the haters. During this episode the guys discuss how they dealt with negativity in multiple areas. Listen to today's episode as ET gives several scenarios and tips on how to deal with hate. Very special shoutout to @DaNobleman for creating the Gazelle of The Week Jingle. [04:00] - Am I Tripping Or ? [44:40] - When is it time to go? Everybody has a dream and everybody has a goal. The problem is that no one has the proper plan to make the dream or goal happen. In order to achieve that thing you’re going after you have to put a strategic step by step plan together. You have to make the choice to wake up every day and work on that plan. The dream is great but the plan is what makes it happen and you have what it takes to get it done. Eps. 88 - Dude, Where's My Car ? This week on the podcast the squad has a special guest. Financial Guru Rob Wilson joins the squad and the discussion is about money. The guys talk a lot about business and a key component in business is money. Rob goes over many different subjects regarding money including how much and how soon to save for your kid's college education, whether or not you should invest in the stock market, and how to deal with debt. Definitely, grab a pen and a pad while listening to this episode. It’s time to get your money right! [30:00] - Should you invest in stocks? It’s time to expand your territory. Expand means to become or make larger, or more extensive. Often times in life things seem to be good or even great and we don’t look for the opportunities to expand. You need to expand your territory and in order to do so you have to make that choice !! Make yourself aware of the fact that there are better things and opportunities available to you. Realize that expanding is something you can do be aware of what you need to do to make that happen. As entrepreneurs it could be very tempting to take shortcuts and cut corners to get ahead. In business we learn that ethics and integrity are very important but we see a lot of individuals get ahead by cheating. CJ asks ET to explain how to avoid the temptation of cutting corners to get ahead. As complex as the question is ET gives us 2 great things to remember when doing business or when doing things for other people in general. Do things as if you’re doing it for yourself. Never build your house on sand because when the storm comes it will not last. [02:39] - Am I Tripping Or ? "When you cut corners you're killing something else that's inside of you." "Don't let your frustration make you stop, allow the frustration to help you keep going." How often do you start something and not put 120% into it ? Have you ever experienced having days, weeks, or months where you just weren’t performing at the level that you should be ? Then something happens that just restarts your ignition. In today’s podcast the guys discuss the importance of taking advantage of your life and the opportunities you currently have. ET explains that you shouldn’t wait until something bad happens in your life to start going 120. You should wake up every single day and give 120 to everything you’re doing. [10:30] - What problems do you solve ? There comes a time in our lives where we have to transition. What gets us to one level of success will not alway help us get to the next level of success that includes dominance. You have to learn to transition and not hold onto things because it worked before. If you’re currently feeling stuck or feeling like you need to do something different it may be time for you to transition. Take action by reading books, going to conferences, and getting around those who are already on the next level. Let’s take action and do what it takes to get to the next level !! Ever felt like you were doing great in life but you have a friend, a spouse, or maybe even your kids who complain about those 1 or 2 things you don’t do well. You probably feel like you’re being attacked in some ways because everything else you do is fire. The problem is because you’re so good in everything else you’ve become complacent in other areas. CJ asks ET how do you know when you’ve become a little complacent ? How do you then work on it so you can become great in that area ? In today’s episode you will learn how to stop the “Hack A Shaq” theory in your life and become great in all areas. Many people want to meet influential and powerful people. Well the secret is out as to how to do it. Add value !!! The best way to get to the next level is to add value to those around you in any way you can. Use your gifts and talents, fill any gaps that you can, find a way to make their life just a little easier. These things go a long way and people will appreciate you for it. Don’t look for people to add value to you look for people who you can add value to. How do you go from being just good to being great ? What does it take ? In today’s episode of The Secret To Success podcast ET walks the guys through 4 key concepts that took him and the squad from being just good to being great. ET urges that as you listen to today’s episode listen to understand the concepts. After you understand the concepts take them and apply them to your journey as needed. The centralized theme of today’s episode is to get in a system or create a system of your own that will get you to the next level. Contact our sponsor Wells Financial Legacy at 1-800-339-8034 for a FREE consultation with a credit specialist. Here is the 4 Animals Assessment the guys keep referring to. Find out if you’re a flamingo, gorilla, turtle, or chameleon. This Power Up episode is about courage. The courage you need to get to the next level is inside of you but you have to own it. Stop comparing yourself to everyone else. Stop worrying about what others are thinking. In order to get to the next level you have to believe in yourself, your gifts, and your talents. Listen to this episode and repeat the affirmations ET gives at the end of the episode. Increase your courage so you can go to the next level. Today’s show is dedicated to Bryant Kilgo whose life was impacted greatly by ET. ET had an opportunity to meet his mother who informed him that Bryant passed away in June. ET and the entire ETA squad would like to send our condolences. Is the term fake it till you make it still valid ? Should current or future entrepreneurs still live with this mindset ? CJ poses this question as he talks about an encounter with someone he’s been helping out. The gentlemen was making things in his life look better than they were and CJ confronted him about it. The gentlemen then explains that he was doing what he thought the squad had to do to get on and then the lightbulb in CJ’s brain turned on. Did they fake it till they made it ? CJ talks about some things they did to make things seem better than they were. Several questions are posed. Were they guilty of doing something that they don’t like others doing ? What are the limits to faking it till you make it ? How long do you fake it till you make it? As you find out the answers to these questions in this episode keep in mind one thing. The biggest problem with faking like you have things together is that you could repel the real help you need. The person who could help you get to the next level could be watching you live your fake lifestyle. [02:55] - Am I Tripping Or ? Our sponsor Paypal is giving away $10,000 to entrepreneurs to give their business a Makeover. Apply for your chance to win cash, publicity, and a free one-on-one consultation. Phenomenal Life Cruise next March. See live tapings of the podcast and meet the entire squad. If you need to take your career or your marriage to the next level come out and join us in one or both of these cities. On today's Power Up episode ET talks about the importance of speed and how procrastination can and will sabotage you. You can't keep waiting and delaying things get things done efficiently and quickly as possible. If you're a procrastinator you have to take control TODAY. Speed can and will change your life. Don't take as much time as it takes take as much time as it needs. So today make the decision to no longer being a procrastinator. "SPEED IS THE ANTY TO PLAY"
The squad will be in Miami August 5 for the Thank God I’m Married Conference. September 2 we will be in D.C. for another Stay Ready Conference tickets are now available. Take your life to another level by joining us on the Phenomenal Life Cruise next March. See live tapings of the podcast and meet the entire squad. If you need to take your career or your marriage to the next level come out and join us in one or both of these cities. The guys have an eventful fun filled weekend. Karl and his family took a trip up north for the first time, CJ and his family hung out in Michigan for a family reunion, and ET and his church family holds their first annual kick ball game. Have you ever been on a flight with a jerk ? CJ had the experience over the week and he admits to almost losing control and possibly getting into a fight with another passenger. CJ explains the situation and then poses the question to Karl and E and asks them what would they have done if they were in the same situation. ET explains how he’s been able to set boundaries to prevent situations from getting out of hand since he’s been baptized again. Every misunderstanding doesn’t have to turn into a full blown argument or even a fight. If you’re struggling with anger issues ET explains that you need to self-assess and figure out what’s really making you angry. Most of the things you blow up over aren’t as serious as you make it but you have to self-assess and see where the anger is really coming from. Listen to how CJ actually handled the situation and how ET and Karl would have handled it. [14:40] - Has ET gone vegan ? Shop for your entire home on Jet.com ! They are giving our listeners a 20% discount on your first two orders over $35. Just use our code “SUCCESS” for your order and get your order in 2 days. The guys are still in Houston after the Stay Ready conference and their experiences are the subject of this week’s podcast episode. After meeting gazelle’s on two occasions the guys dive deep into the difference of an owner’s mentality and a worker’s mentality. Essentially when you’re operating like a gazelle in the workplace it’s because of this mentality. After discussing the difference CJ asks the guys what do you do when you’re doing something you’re not passionate about for a living and it’s hard to give 120. [03:49] - Am I Tripping Or ? [50:00] - What does it feel like being ET ? If you’re busy but you want to eat healthy fresh food then please check out Hello Fresh ! You’ll get fresh food perfectly proportioned with all of your ingredients straight to your door. They are giving our listeners a nice discount on their first order. Just use our code “SUCCESS30” and tell us what you think ! The squad will be in Miami August 5 for the Thank God I’m Married Conference. September 2 we will be in D.C. for another Stay Ready Conference stay tuned for tickets. Take your life to another level by joining us on the Phenomenal Life Cruise next March. See live tapings of the podcast and meet the entire squad. If you need to take your career or your marriage to the next level come out and join us in one or both of these cities. The guys recorded their first live podcast in front of an audience last week and it’s probably the best podcast episode ever. Karl kicks off the episode with the introduction of ETA’s first children’s publication. My Secret Super Power: Trey’s Jungle Adventure . CJ talks about the process of writing the book and gives some advice on how to handle unexpected setbacks while working on projects. After writing the book CJ discovered that although it’s a children’s book many adults can benefit from the message. The main focus of the episode is the importance of shifting from a consumer mindset to a producer mindset. The guys explain how we are conditioned to consume as much as possible and that stops most people from actually producing anything. After listening to this episode you should walk away with a few key nuggets of information that involve going from a consumer to a producer, how fake confidence doesn’t work, and how to understand and adjust your view of the world. Thank you so much for listening to this episode of the Secret 2 Success podcast. If you haven’t done so already, please take a minute and leave a quick rating and review of the show in iTunes by clicking. This will help us to keep delivering great content to you every week ! In this Tuesday Power-Up, ET talks about choosing to take control of your life and staying ahead of your competition. We’ve seen some of the best dynamic duos create history in their fields and ultimately break up. The most recent break up is with ESPN’s Mike & Mike who have worked together for 18 years and are now calling it quits. This caused CJ to think about the possibility of the squad breaking up. Could it happen ? CJ challenges the guys and ask them have they ever thought of the squad possibly breaking up.The guys all explain how they safeguard those thoughts and keep their ego in check so that it doesn’t happen. ET makes a very important point that in order to keep things like this from happening he makes sure that the guys understand and know how much he appreciates them. CJ talks about his real reason for not having his own social media pages as it could possibly cause a distraction to what his role is. No one wants to see great duos or trios that make history break up but it’s a strong possibility in the world we live in today. You'll learn in this episode that as long as everyone stays in their lane it's hard for that to happen. [24:00] - Can the squad break up ? The guys are back this week and they kick off today’s episode with a weekend recap. Baby Avery turned one, the guys in Lansing did more demolition on the ETA compound, and Josh’s son Hudson won the state championship in golf. CJ starts off the conversation by asking the guys a question that he was asked by a listener. What do you do while you’re waiting to blow up ? You’re applying the principles you’re learning, you’re studying your craft, but things just aren’t moving as fast as you want them to. So what do you do ? ET explains that at one point in time he actually stopped speaking and found other ways to serve and add to his craft. When he stepped away is when he, CJ, & Karl started working together at MSU. Karl discovers that even back then the squad was doing the same thing that they are doing now. The key principle in this episode is to stay in go mode and master your craft. Even while waiting to blow up you should be working on your craft. ET says that for many aspiring speakers, they only speak when they speak. This statement can be used for more than speakers. No matter what level you’re on in your journey make sure that you are always working on your craft. What does it take to sit at the table with important people ? In this week’s episode ET, CJ, & Karl walk us through what it takes to get to sit down and be around influential people. Although ET admits that was never the goal when they set out on this journey, it’s something that he’s doing more and most importantly appreciating. As ET recaps his star studded week CJ acknowledges that ET had to become a specific type of person to in order to get these opportunities. He had to sacrifice some things for the sake of his message and the overall mission of ETA.Karl and CJ have been along for this ride for quite a while with ET and have helped him get to these tables. CJ even explained that anytime ET is at these events he feels like they are there with him. The guys know firsthand what it takes to sit at these tables. Now it’s time for you to learn. [30:00] - Who did ET have to become ? [50:30] - What are you chasing ? Thank you so much for listening to this episode of the Secret 2 Success podcast. If you haven’t done so already, please take a minute and leave a quick rating and Review of the show in iTunes. Get connected with a network of over 3,500 people who listen to ET, and embodies the work ethic and spirit of ET. Join Breathe University today ! Check out this all new-weekly message from ET. In today's power-up message from ET...Faith over Fear, Destroy Doubt and Discover Untapped Power. 5. Where Is My Summer Body? 2. Fake It Till' You BREAK It! 4. CJ and Karl lose it. Happy New Year!! It's a New Year and a New Grind! ET and Karl share their interesting new year experience and plans for ETA in 2017. Resolutions. We've all made one, and most of us have broken one. Will this be the year where you uphold your resolution? Find out how to end the broken resolution streak and become resolution proof. From huddling around fires in the primitive years to congregating around charging stations in airports today, Energy has always been an essential ingredient to our survival...How well are you protecting your energy? 1. The truth behind the missed podcast. Success in life and love means staying on course. As we candidly share all of our ups, downs and strategies for sustained marital bliss, we hope you’ll chart your course and, take your next happily married steps with us! Single People, STAND UP! This course is for you too! If you’re dating, engaged or thinking seriously about becoming engaged, you need to grab a seat as well! Trust us, your relationships will be so much sweeter if you know where the potholes are and how to avoid them! Welcome to your next levels of happiness! TGIMarried, Honest, Candid, Real. 4. You're starting at NO, what do you have to lose? 1. What's in your wallet? 1. Who made Karl cry? 4. What successful people DON'T do! 4. How to Making Money from a "NO"
2. Start living the life you deserve. 2. Lebron - Crown him KING!!! Ep.26 - We Ain't There Yet!!! 1. ET an absentee Father? 2. Has Organic Gone Too Far? 4. Take advantage of N.O.W. 5. We lost a great one! Ep24 - Chik Fil-A or McDonalds, Which are you? 1. Is that it for the Kevin Durant Legacy? 3. Which is more important Who we are, or what we do? 4. CJ shares his secret to turning around a dying company culture. 1. Am I tripping or: Is the NBA rigged? 2. E's Theory as to why the Warriors are losing. 3. Are you an Entrepreneur or are you just chilling at home? 4. What are your RGA's and how much time do you spend doing them? 5. What can Tetris teach us about life? 3. Why the underdog mentality is a huge asset. 1. Signs of old age? 2. How do you know when to support those in "needy"
3. When should you start begging for help? 1. Somebody sent CJ what? 4. ET's elephant in the room? 5. How each of the guys proposed to their wives. 6. ET swears like a sailor? What do Prince & Beyonce Have in common? The fate of the "Jack of all trades"
1. Am I tripping or - How much are your values worth? 4. ET's secret speaking sauce - "People love fresh, hot, seasoned food"
1. Find out what makes the Mamba, The Mamba. 3. The Warriors did it! But are they better than Jordan's Bulls? 4. Honor thy Craft! Why most people fail in business and relationships. 5. CJ teaches us a Jedi Mind Trick to remain Focused on the task at hand. 6. ET's Nugget of the day! 3. How to be prepared for your moment! 1. Spare the rod, Spoil the Child? 2. What ET learned from Rihanna? 4. When does ET not consider himself "BEAST MODE"
5. "I prayed to meet ET"
1. Are generations getting softer? Ep12: The True Value of Your "Credit Score"
When we hear the term "Credit Score," we often only think about financial transactions. In this episode however CJ and ET challenge us to think about the number that would be associated with your "track record of character." Can people count on you to execute the task(s) you committed to? 2. What your "Credit Score" really says about you! 4. Voice Overs - E's greatest speaking struggle revealed. Ep11: Are you really about that life? 4. Are you a true "grinder" or do you simply have "grinding" tendencies. 3. Why you aren't making more money. 1. ET's Limit. When does ET quit? 2. Why thinking beats hard work every time! 3. CJ reveals the gender of his new "why"
6. The sure way to increase you circle of influence! Is ET the new Dr. MLK? How your daily routine affects your ability to achieve greatness? Ep3: "Momma I'm on TV"
How to deconstruct your long term goals. What New Year's Resolutions the guys have?